Been a while, hasn’t it? I was reminiscing this weekend with my girlfriend about an event at Tales of the Cocktail a few years ago. Zwack invited the CSOWG to a lunch where they were showing us their new American release (and giving us sample bottles). If I remember correctly, there was even the Countess Zwack there to promote it and we had a good time. The American variety is to the left, the older on the right. Note how logos are slightly different and the placement of the name varies, with the older also prominently declaring itself “Unicum”. So the reason I was thinking of this was that the Boozy Book Club I’m in had recently covered a book on amaro, and my girlfriend, who is also in it, commented that she had a mini of Zwack that she’d been given a few years ago. She brought it over and I compared it to the bottles I have. 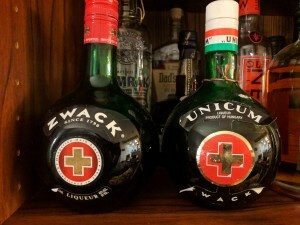 Like the older bottle, it said both “Unicum” and “Zwack” and the gold cross was slightly offset from the outline. Now, when we had tasted Zwack back at TotC I remember liking the American version and being blown away by the bitterness of the older one. We tasted her mini and it was herbaceous and bitter but it wasn’t bad. Tentatively, I poured out a shot of the older variety. They certainly looked the same. They tasted almost identical, close enough that the variance could perhaps be explained by storage conditions and age. Curious, I poured a shot of the American variety. Immediately there was a difference, it was much lighter in color than the others had been. We tasted it and couldn’t pick up any bitterness at all! It was just slightly herby and sweet. So now I no longer fear that older bottle of Zwack like I once did, which means, in all probability, I’ll be draining the bottle then wondering how to get more. Do you have thoughts on Zwack? Tell me on Twitter or comment on our Facebook post! I guess it must have been just over ten years ago now when Marshall came by my condo. “We’re going to start making own simple syrup and squeezing our own juices for cocktails,” he told me. Since we started this thing almost ten years ago I’ve had a sort of saying that I’d bring up occasionally about the liquor biz. The best combination in the business is when you have good products coming from good people. For example, I often use Catoctin Creek Distilling Company to illustrate this, or perhaps Haus Alpenz as well. Hey guys, I’m doing a class! Saturday, June 10th at 2:30 PM at Dino’s Grotto I’ll be doing a class with Andrew Shapiro and Dean Gold there. We’ll talk about the cocktail itself plus the ingredients that go into it. You’ll get a chance to try a few different variations of the Negroni and even come up with your own version if you’d like! There will also be snacks.